The Exploratorium is a museum of human perception, science and art, located in San Francisco, CA. The goal of the organization is to challenge people to explore and discover using more than 330,000 square feet of space. The museum has won numerous awards, including Trip Advisor’s Certificate of Excellence. 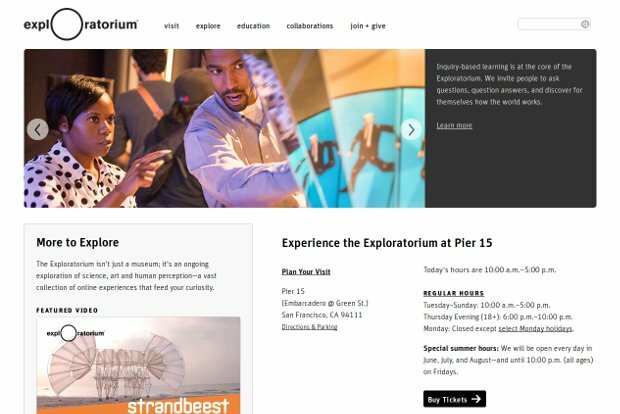 The Exploratorium is an eye-opening, playful place—in San Francisco and online—to explore how the world works. For 40-plus years, it is offering creative, thought-provoking exhibits, experiences, tools, and projects that ignite curiosity, encourage exploration, and lead to profound learning. They believe that following your curiosity and asking questions can lead to amazing moments of discovery, learning, and awareness and can increase your confidence in your ability to understand how the world works. They also believe that being playful and having fun is an important part of the process for people of all ages. They have created tools and experiences that help you to become an active explorer: hundreds of explore-for-yourself exhibits; a website with over 50.000 pages of content; film screenings; workshops for lifelong learners including day camps for kids and family investigations; evening art and science events for adults—and much more.